When you’re creating a new asset, or adding a new revision to an existing asset, you can check the option to Create as draft. Drafts require approval, ensuring consistent use of a particular versions of content by teams. More on Chipmunk's Draft Workflow. When creating a new asset, select Create as draft and a draft of the new content will appear in the Drafts tab once you submit. The draft will require approval before appearing in the collection(s) specified when creating it. You can optionally add up to 5 assignees to drafts you submit. Assignees will see the pending draft under My Drafts in the Drafts tab and will receive a notification of the assignment. You can change assignees at any time by viewing the draft. Note: if you are uploading from within the Drafts tab, by default the file will be uploaded as a draft. 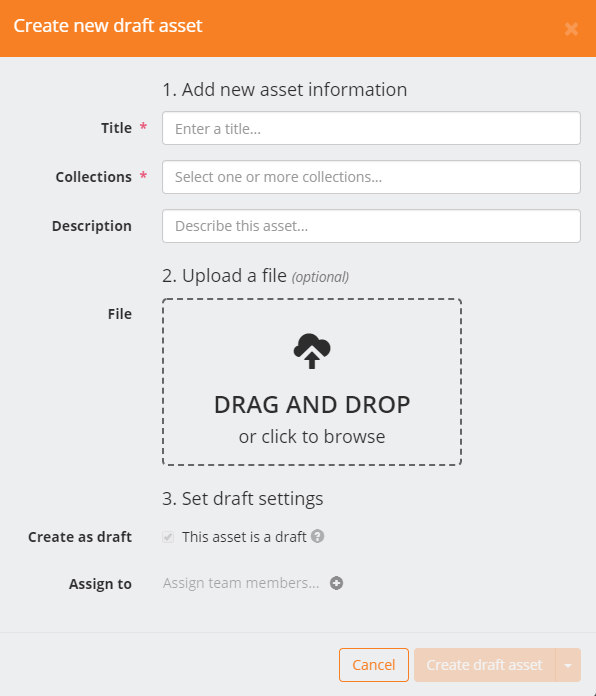 When updating the content for an existing asset, after clicking the button in the top right corner of the asset view or by dragging the new file (or files) directly into the asset, check Create as draft to create the new revision as a draft. You can view an asset’s open drafts as well as ones that were previously approved, rejected or otherwise closed by clicking the button in the asset. These drafts and also be found in the Drafts tab. You can also use drafts to request the creation of new content. When creating a new asset or a revision to an existing asset, you can opt to not upload a file (or, to upload a mockup or other starting material) when submitting. This will create a draft that your team can edit and continually add new files to until the content is approved. Approving will create the new asset or revision to an existing asset, updating the file for the asset to be the final approved one. More on editing an open draft and on requesting content.